The malachite butterfly (Siproeta stelenes) is a large butterfly with a wingspan similar in size to the monarch butterfly. Like the monarch, the malachite butterfly is known as a brush-footed butterfly. This classification is given to butterflies that have very small forelegs that are not very useful for walking. 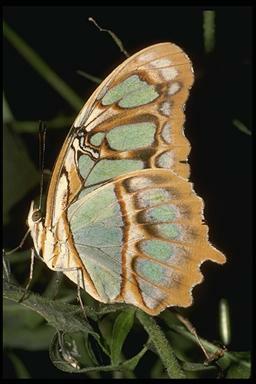 The malachite butterfly belongs to the family Nymphalidae. Unfortunately, if you live in the northern states of the United States you won't see this beautiful butterfly. The malachite butterfly is a tropical butterfly and is most common in South and Central America, and Texas and Florida within the United States. This butterfly gets its name from the mineral "malachite" because the green coloration on their wings resembles the green color of the mineral malachite. The female malachite butterfly lays her eggs on Ruellia (Ruellia coccinea) or Cafetin (Blechum brownei) plants of the Acanthaceae family. Once the eggs hatch, the larva feeds on these plants. The malachite caterpillar is black with red horns and black spines that extend from its body. It forms a green chrysalis that is somewhat similar in appearance to that of a monarch butterfly chrysalis. 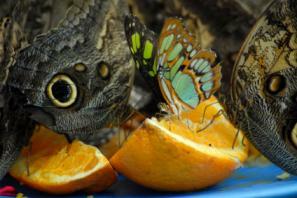 The adult malachite butterfly feeds on rotting or overripe fruit as seen in the photo (it is the middle butterfly). Malachites enjoy citrus fruit very much. They also feed on flower nectar and sometimes on carrion.